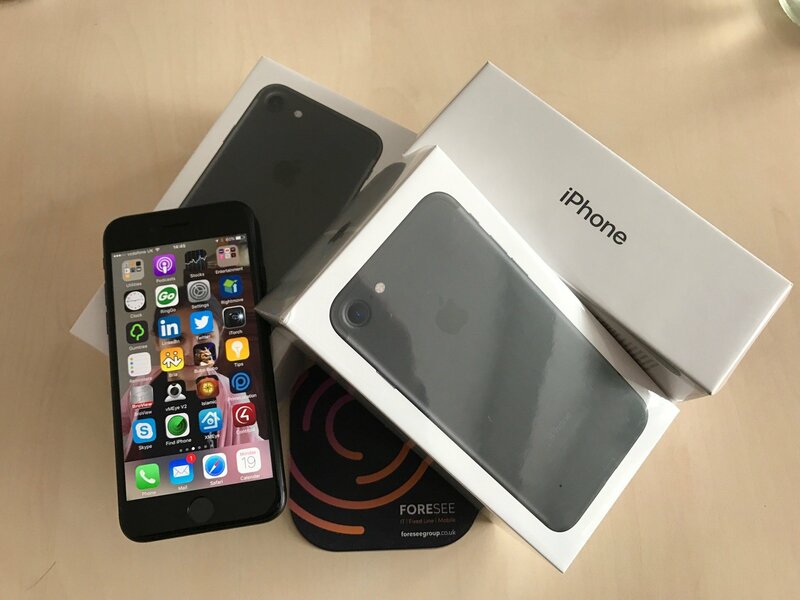 How to get Apple’s iPhone 7 for FREE with Foresee! Apple’s iPhone 7 was released on 16th September 2016 and we were lucky enough to get our hands on 12 phones for our customers. Due to high demand these phones were gone within an hour and we now have a further 15 on back order for when Apple restocks. Unsurprisingly the iPhone 7 is incredibly popular as Apple never fails to create a buzz around its iconic product. On the morning of release the iPhone 7 Plus had already sold out and the iPhone’s newest colour, the jet black model, sold out too. However, don’t worry, as we can get our hands on the model that you and your business want, so please get in touch today for further information. Bear in mind that if you want your new phone before Christmas you will need to order them now! Plus, at Foresee we are able to offer the iPhone 7 for FREE for customers on certain mobile contracts. Many mobile providers are offering the iPhone 7 at an extra cost so don’t miss out on this incredible deal. In the meantime, why not check out the iPhone 7’s shiny new features? After all, you could be enjoying Apple’s iPhone 7 sooner than you think! Choose between the iPhone’s new black and jet black finishes. The iPhone 7 and iPhone 7 Plus is also available in silver, gold and rose gold. After years of asking for the iPhone to be water resistant, Apple have finally listened! The new iPhone is splash and water resistant as the entire enclosure has been adapted so that it is protected against splashes, spills and dust. Apple has created the Home button on the iPhone 7 to be even more responsive and pressure sensitive. The button has advanced solid-state technology and works alongside the new Taptic Engine within the iPhone. Everyone loves the ease of taking a picture using their phone, but it can be frustrating when the picture doesn’t deliver what you expected. Apple have tried to prevent these frustrations by adding optical image stabilisation and 3 x longer exposure compared to the iPhone 6s. The iPhone 7 has the longest battery life ever in an iPhone. If that doesn’t persuade you that you need the iPhone 7 we don’t know what will! For more information about the iPhone 7 and how Foresee can offer it to you for free, please get in touch today via the form below.